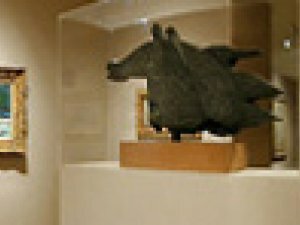 The main objective of the exhibition is to provide a complete overview of Braque’s artistic career as well as to convey his role as one of the key painters of the 20th century. To achieve this aim, a group of 50 paintings and 6 sculptures have been loaned from museums and private collections around the world: the Statens Museum for Kunst (Copenhagen), the Staatsgalerie (Stuttgart), the Tate Gallery (London), the Centre Georges Pompidou (Paris), the Musée de Grenoble, the Musée Picasso (Paris), the Paule and Adrien Maeght Collection, the Museo de Arte Contemporáneo de Caracas Sofía Imber, the Menil Collection (Houston), the Fondation Margerite et Aimé Maeght, the Collection of M. and Mme. Claude Lorens, etc. Among the key events of Braque’s career was undoubtedly the co-invention of Cubism together with Picasso, representing a key chapter in the history of modern art. Alongside Picasso, Braque’s creation of new techniques and pictorial devices such as papier collé and painted words, his unique interpretation of the traditional genres of painting, in particular landscape and still life, his constant rethinking and investigation of the representation of space, volume and colour, and the solutions he formulated in his works have all become landmarks in the history of 20th-century art. In addition, their influence on numerous contemporary artists is both an obvious and extremely important one.